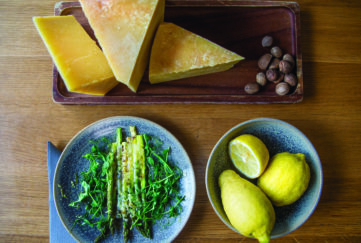 Readers will of course form their own conclusions as to the nature and origin of the manifestations described by Mr Phin, in the article below. As, however, the subject raises wide issues we have invited Mr. W. Herries, who has for many years made a close study of such phenomena to add his views.— Editor. 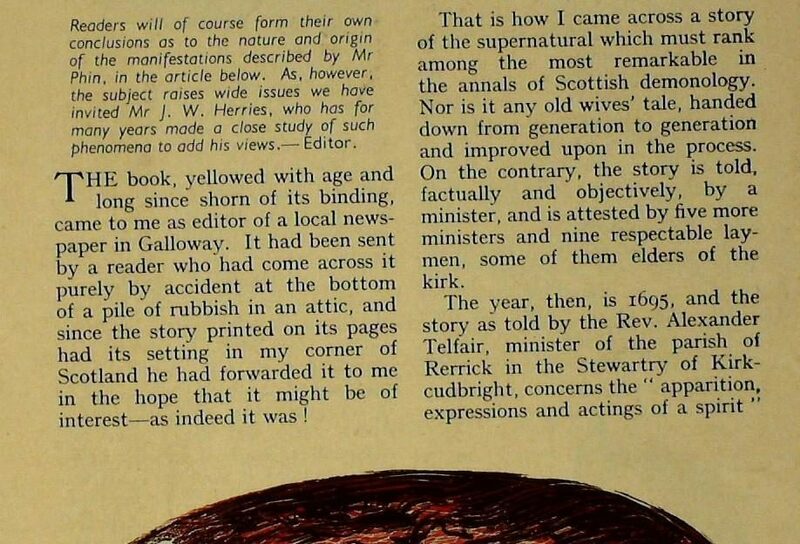 The book, yellowed with age and long since shorn of its binding, came to me as editor of a local newspaper in Galloway. It had been sent by a reader who had come across it purely by accident at the bottom of a pile of rubbish in an attic, and since the story printed on its pages had its setting in my corner of Scotland he had forwarded it to me in the hope that it might be of interest—as indeed it was! That is how I came across a story of the supernatural which must rank among the most remarkable in the annals of Scottish demonology. Nor is it any old wives’ tale, handed down from generation to generation and improved upon in the process. On the contrary, the story is told, factually and objectively, by a minister, and is attested by five more ministers and nine respectable lay-men, some of them elders of the kirk. The year, then, is 1695, and the story as told by the Rev. 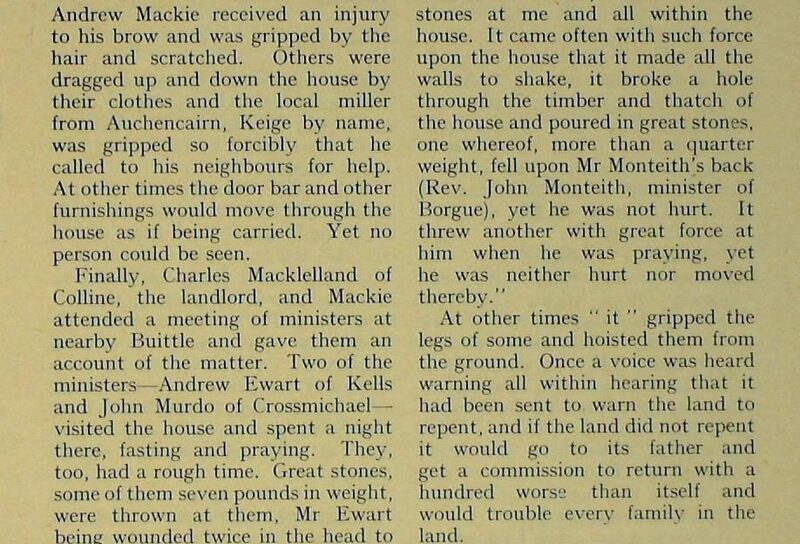 Alexander Telfair, minister of the parish of Rerrick in the Stewartry of Kirkcudbright, concerns the “apparition, expressions and actings of a spirit” which infested the house of Andrew Mackie, Ringcroft of Stocking, in the parish of Rerrick. Andrew Mackie’s troubles apparently began in February, 1695, when he discovered that the bindings which secured his beasts had been loosened and broken overnight. Blaming the beasts, he made stronger bindings, but they, too, were broken, he then moved his beasts to another outbuilding, and the first night thereafter found one of them bound with a hair-tedder to the back of the house in such a way that the feet of the animal scarcely touched the ground. Shortly afterwards, when the family was asleep, a creel of peats were placed together in the middle of the floor and set alight. Fortunately, the smoke wakened Mackie and his family, otherwise both house and occupants would surely have been destroyed. As time passed, the “manifestations” increased in frequency and severity. In March of that year stones were being hurled all over the interior of the house, but it could not be discovered whence they came or by what or whom they were thrown. This went on for four days and nights and was witnessed by many people. It was observed, too, that the stones which hit any person had not half their natural weight, and that the throwing was more frequent on the Sabbath and during prayer. The matter was reported by Mackie to Mr Telfair, the minister of the parish, who visited the house a day or two later. At first nothing happened and the minister was standing at the barn end, about to take his departure when he saw two stones drop on the house, and immediately those inside the house began to cry out that the spirit was at it again. Mr Telfair then went into the house and as he was at prayer several stones were thrown at him, but did no hurt. Later in the week Mr Telfair spent a night at the house, and was greatly troubled. Stones and several other objects were thrown at him, and he was struck several times on the sides and shoulders very sharply with a great staff, so that those who were present heard the noise of the strokes. There was also much rapping on chests and boards as one calling for access. These incidents, Mr Telfair relates, were witnessed by Charles Macklellan of Colline, William Mackminn and John Tait, in Torr. That night as Mr Telfair was at prayer he felt something pressing on his arm and saw a little white hand and arm from the elbow down. After that the spirit became more active and more abusive than ever. 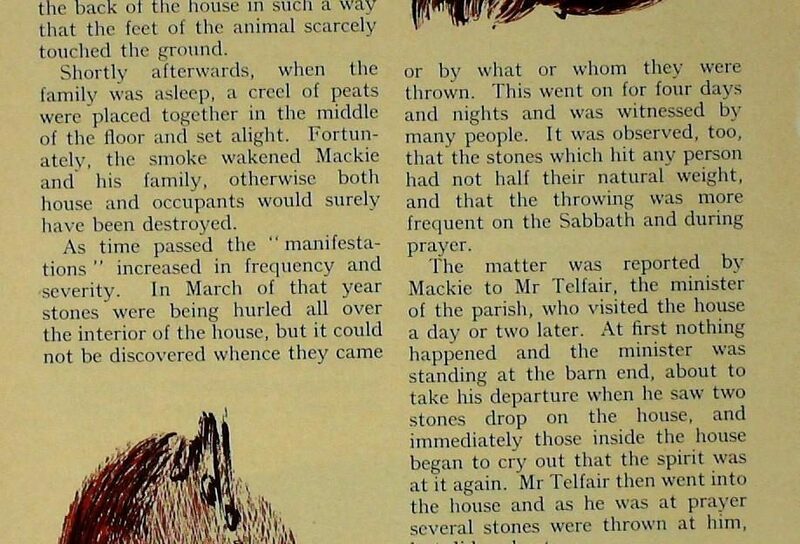 Not only the Mackie family, but also neighbours who came to visit them, were stoned and beaten with staves. Andrew Mackie received an injury to his brow and was gripped by the hair and scratched. 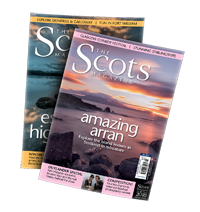 Others were dragged up and down the house by their clothes and the local miller from Auchencairn, Keige by name, was gripped so forcibly that he called to his neighbours for help. At other times the door bar and other furnishings would move through the house as if being carried. Yet no person could be seen. Finally, Charles Macklelland of Colline, the landlord, and Mackie attended a meeting of ministers at nearby Buittle and gave them an account of the matter. Two of the ministers, Andrew Ewart of Kells and John Murdo of Crossmichael, visited the house and spent a night there, fasting and praying. They, too, had a rough time. Great stones, some of them seven pounds in weight, were thrown at them, Mr Ewart being wounded twice in the head to the effusion of blood while Mr Murdo received several sore strokes. No one in the house that night escaped from the spirit’s fury and cruelty. 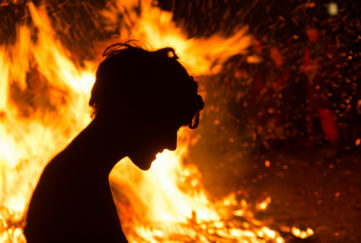 Fiery peats were thrown among the people, and in the dawning when they rose from prayer the stones poured down on all who were in the house. And so it went on. William Macminn, blacksmith, was wounded on the head by a flying stone. 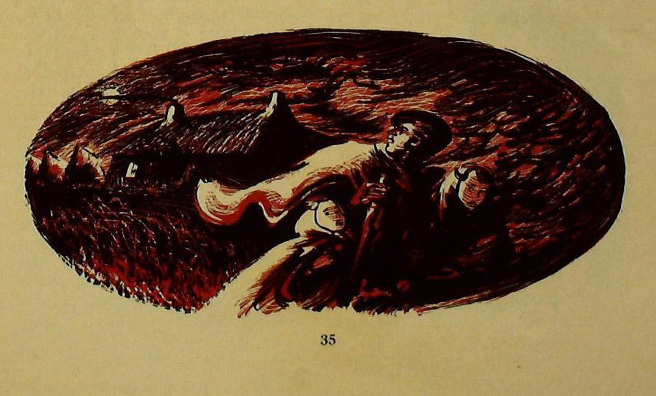 A plough sock was cast at him, followed by a stone trough which fell upon his back, but without hurting him. Twice the house was set on fire, but by good fortune no serious damage was done. As the local ministers were at that time meeting at Kirkcudbright, five of their number were appointed to go to the house with Mr Telfair and to spend as much time as possible in fasting and prayer. At other times it gripped the legs of some and hoisted them from the ground. Once a voice was heard warning all within hearing that it had been sent to warn the land to repent, and if the land did not repent it would go to its father and get a commission to return with a hundred worse than itself and would trouble every family in the land. Then followed the names of five ministers and nine laymen who attested to the accuracy of Mr Telfair’s relation. 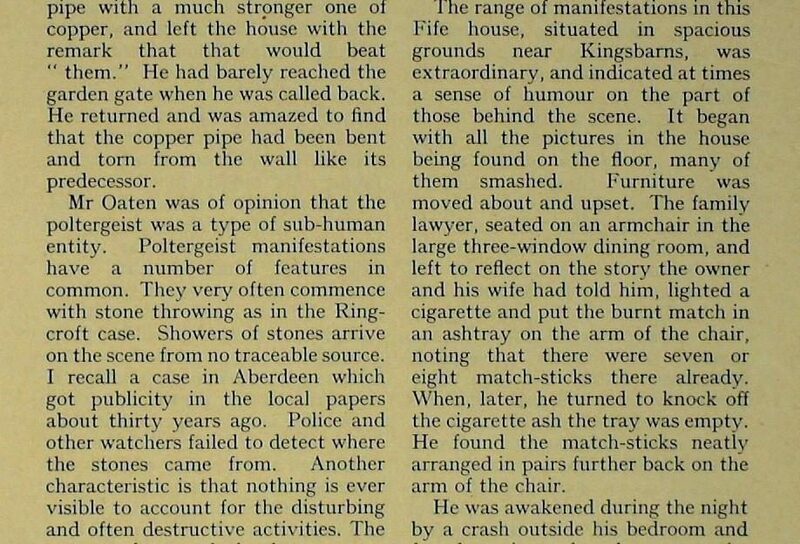 The Ringcroft case in Galloway is one of the earliest and most carefully detailed accounts of poltergeist manifestations. The outbreaks of some power of action deriving from abnormal sources have been observed in every country of the world at frequent intervals. The term “Poltergeist ” indicates a mischievous or racketing spirit, and Germany, from which the word comes, has had its full share of these occurrences. I remember when in Egypt being told of a current case in the house of a doctor, of which the narrator, the curator of the Museum at Luxor, was a witness. Such phenomena have been frequently observed in France. They have occurred in this country at the rate of two or three every year. A few years ago, when I was spending some months in Manchester, two cases in neighbouring towns received a lot of local publicity. One was in a very old building, formerly a jail, in a shop for the sale of superfluous army stores. Goods of various kinds were thrown from the shelves and found in heaps on the floor. On one occasion a consignment of boots was pulled from the shelves and left in a heap. 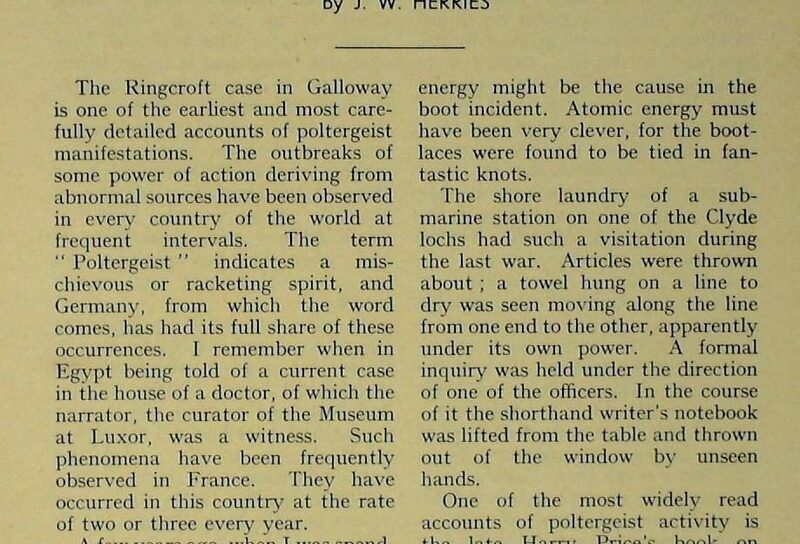 A Scottish professor suggested that spontaneous atomic energy might be the cause in the boot incident. Atomic energy must have been very clever, for the bootlaces were found to be tied in fantastic knots. The shore laundry of a submarine station on one of the Clyde lochs had such a visitation during the last war. Articles were thrown about; a towel hung on a line to dry was seen moving along the line from one end to the other, apparently under its own power. A formal inquiry was held under the direction of one of the officers. In the course of it the shorthand writer’s notebook was lifted from the table and thrown out of the window by unseen hands. One of the most widely read accounts of poltergeist activity is the late Harry Price’s book on Borley Rectory, but the Borley case is mixed up with features which go beyond the province of the poltergeist. One of the greatest authorities on the poltergeist, if the word can be used in relation to an exercise of energy, of the nature of which so little is known, was the late Mr Oaten, editor of the Two Worlds. He had witnessed many poltergeist cases in operation. One occurred in a small modern house in Manchester. While he was in the kitchen talking to the wife of the owner, a tea-pot sitting on the cooker was lifted and thrown through the doorway into the hall. Here, as in many of these cases, great physical power was occasionally manifested. The cistern pipe, sunk into the wall of the bathroom, was forcibly torn out. A plumber came to repair the pipe and was very much puzzled as to how the damage had been done. He replaced the lead pipe with a much stronger one of copper, and left the house with the remark that that would beat them. He had barely reached the garden gate when he was called back. He returned and was amazed to find that the copper pipe had been bent and torn from the wall like its predecessor. Mr Oaten was of opinion that the poltergeist was a type of sub-human entity. Poltergeist manifestations have a number of features in common. They very often commence with stone throwing as in the Ringcroft case. Showers of stones arrive on the scene from no traceable source. I recall a case in Aberdeen which got publicity in the local papers about thirty years ago. Police and other watchers failed to detect where the stones came from. Another characteristic is that nothing is ever visible to account for the disturbing and often destructive activities. The tenant of one of the houses near Manchester showed me a sideboard which had been smashed to pieces, exposing the glued-in dowels which had been torn from their sockets. Another feature common to poltergeist hauntings is that they are short-lived. They usually begin mildly, increase in intensity to a maximum, and then suddenly cease, it is as if in the unseen world which the perpetrators inhabit they have escaped from some kind of restraint, indulge their powers for a time, until the escapades are discovered and they are again brought under control. The three months of the Ringcroft episodes is the usual period of duration. The hauntings frequently end with incendiarism. That was the experience, as in the Ringcroft case, in a Fife mansion which some fifteen years ago produced the most intensive record of poltergeist haunting in recent times. The range of manifestations in this Fife house, situated in spacious grounds near Kingsbarns, was extraordinary, and indicated at times a sense of humour on the part of those behind the scene. It began with all the pictures in the house being found on the floor, many of them smashed. Furniture was moved about and upset. The family lawyer, seated on an armchair in the large three-window dining room, and left to reflect on the story the owner and his wife had told him, lighted a cigarette and put the burnt match in an ashtray on the arm of the chair, noting that there were seven or eight match-sticks there already. When, later, he turned to knock off the cigarette ash the tray was empty. He found the match-sticks neatly arranged in pairs further back on the arm of the chair. He was awakened during the night by a crash outside his bedroom and found a piece of sculpture on the carpet outside the door, in fragments. A few days afterwards a sculpture bust hurtled from its pedestal in the hall and smashed against the wall, narrowly missing the head of a member of the family. The drawing-room furnishings were found in a heap. An eight-day clock, found by a maid on three successive mornings on its face, lay smashed to splinters on the fourth. Billiard balls disturbed the sleep of the owners by rolling about the floor in the bedroom where they had no right to be. One morning the owner’s wife took the balls, one red and two white, and buried them secretly in the grounds. That night they were disturbed again, and a red ball was found on the floor. She went to the spot where she had buried the balls and dug them up. The two whites were there but the red ball was gone. I spent a night in the dining-room without disturbance of any kind. But a few moments after I left the room in the morning an employee heard a crash and going into the room found a heavy mahogany table on its side. Finally, one afternoon, fire broke out in a number of rooms simultaneously, originating in every case in one of the corners at the height of the ceiling. A claim for insurance was made and met by the insurance company, who made the fullest inquiry and were satisfied that no one in the household had any responsibility for the fires. 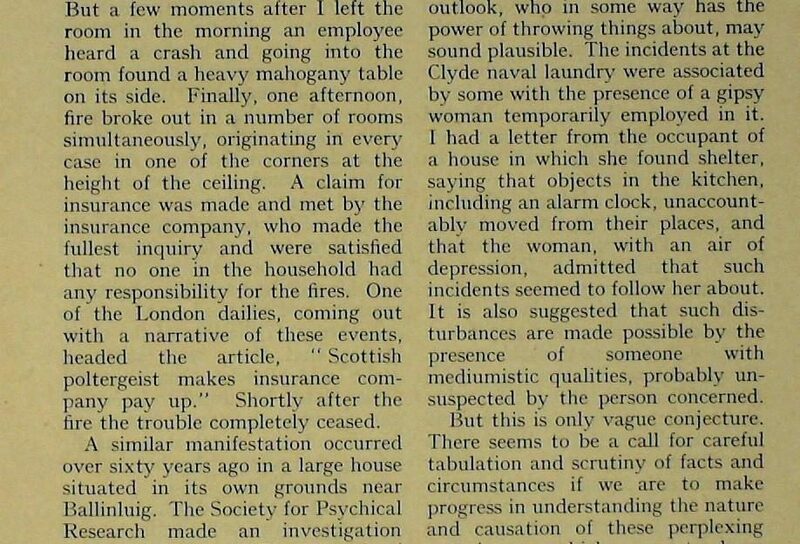 One of the London dailies, coming out with a narrative of these events, headed the article, “Scottish poltergeist makes insurance company pay up.” Shortly after the fire the trouble completely ceased. In this instance poltergeist incidents, which included a booming, bell-like sound that at times seemed to fill the house, were associated with occasional apparitional appearances, and the mysterious sound of footsteps. No normal cause was discovered for the variety of incident recorded. It is frequently suggested that such outbreaks are attendant on the presence of a boy or girl in their early teens. I do not think the theory is established. It will also be found that in most instances there is a middle-aged or old person in the household. A suggestion that an adolescent may attract a mischievous entity of similar age and outlook, who in some way has the power of throwing things about, may sound plausible. The incidents at the Clyde naval laundry were associated by some with the presence of a gipsy woman temporarily employed in it. 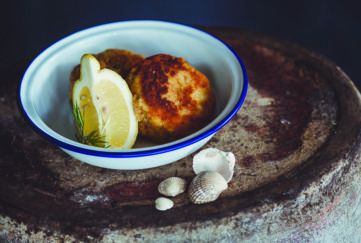 I had a letter from the occupant of a house in which she found shelter, saying that objects in the kitchen, including an alarm clock, unaccountably moved from their places, and that the woman, with an air of depression, admitted that such incidents seemed to follow her about. It is also suggested that such disturbances are made possible by the presence of someone with mediumistic qualities, probably unsuspected by the person concerned. But this is only vague conjecture. There seems to be a call for careful tabulation and scrutiny of facts and circumstances if we are to make progress in understanding the nature and causation of these perplexing experiences, which seem to have their sources in the unseen and largely unexplored side of human existence. The location of the Ringcroft cottage is marked by a row of trees conspicuous on the sky-line near Auchencairn. The trees, reduced from four to three by a recent storm, grow from the site of the cottage, the foundations of which are still there. You can see the article in its original format (with annotations from over the years! on the right. Check back next Monday for another ghostly tale.